I’m fiery and loud and opinionated. I am obsessed with finding the answers to questions. I think Google is a brilliant invention. I look for answers everywhere. I talk in circles about my childhood—in search of new truths. I try to find the reason for what makes a person tick. I research solutions in the middle of tricky construction projects and when I forget how to cast off my knitting. I like when problems have solutions and questions have answers. For a girl who really likes answers, it is a wonder that my faith is so simple. It is an act of desperate love and equally desperate longing. 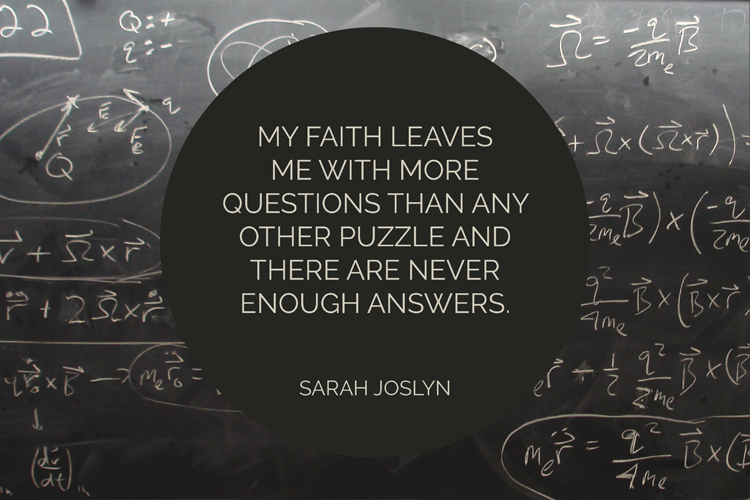 My faith leaves me with more questions than any other puzzle and there are never enough answers. You see, I’ve devoured stacks upon stacks of church history books and commentaries and seminary notes. I’ve started with one question and, after a whole lot of reading, I am left with 13 more questions and zero answers. I think looking for the answers is important, but I’m not that worried about having the answers. Maybe it is because I’m prone to changing my mind. Maybe it’s because the older I get, the less I know and the more I know I don’t know anything. Maybe it’s because I’ve watched churches tear apart over semantics and I’ve watched people look the other way when they probably should have been mad. I don’t have any answers. I don’t have a solid theology for how to grieve or how to rejoice. I don’t have a problem believing Genesis is just poetic interpretation, nor do I have a problem believing a big God can create a big universe in only six days. I don’t feel uprooted when my personal theology must change. I was 13 when I started to learn about a Teacher-Messiah-God-man who didn’t hate me or want to punish me. I was desperate for love and I was longing for truth. I let myself get emotional about it all, like teenagers do. When all my feelings wore off I could still see a story I wanted to be a part of—a story of redemption and healing. But seriously, healing—crippled people who walked and blind people who saw and families reconciled. A story of the hungry getting a meal and the thirsty getting a drink and an extended hand to women and racial minorities and the neglected, wounded, sick, broken … everyone. I am just as enamored with this story as I was when I was 13. My faith is far too simple for Twitter arguments and hate speech between Christian brothers and sisters. I’m not saying I don’t have a side. I’m not even saying I won’t speak up. I am just acknowledging that I have no idea what is right. I don’t know if there is a right way to live out faith. I doubt it. Because I have felt at home in the middle of happy-clappy evangelical charismatic churches and I have also been lost and out of place with the same people. I have found comfort in liturgical, quiet churches and I have also felt alone there. I feel closer to my community and to God than I ever have in years and I have not stepped foot in a church in months. I don’t have enough hours in a day to consider if I’m on the right end of Truth with a capital T. I’m too busy trying to be on the right side of History while I advocate and stand with and learn as much as I can about justice and equity and basic human rights. Maybe it’s a cop-out, but I go with my gut. I hope that when I stand before the Creator of the Universe, I won’t get in trouble for welcoming too many people and letting too many ideas into my life. If my simple faith in the Teacher-Messiah-God-man is really the faith of a child, then I might be okay after all.